One of the best parts about Halloween is getting the whole family involved in decorated the house to make it scary for trick-or-treaters. One of the most fun ways to do this is to turn the area leading up to your front door into a haunted house. Homemade haunted houses can be extremely easy and cost effective to put together but are something fun the whole family can do to prepare for Halloween. Here are tips on how you can easily put together a haunted house this next Halloween. One of the best ways to create an eerie atmosphere for your guests and trick-or-treaters on Halloween is by utilizing spooky lighting. If your haunted house area is too bright it will not feel remotely scary to guests. 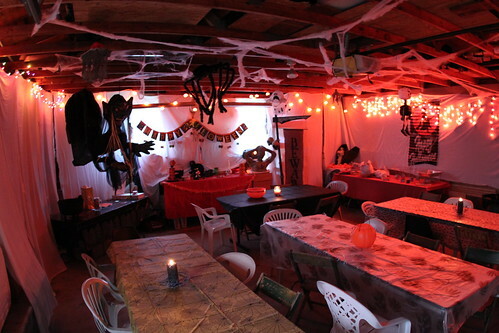 Consider blocking off an enclosure for your haunted house using tarps or plastic siding. This will help to not only darken the area but will also make trick-or-treaters feel more trapped and frightened. Once you have your haunted house area closed off you can use simple flood lights to brighten the area; however, it will add to the spookiness if you replace the floodlight bulbs with green, orange and black lights. These lights are easy to find at your local hardware store and are fairly inexpensive. If you can, put the lights on a flicker switch so that guests get a flickered distorted view of where they are going and the frights that are up ahead. Fog machines are another way to cheaply add to the visual spookiness of your haunted house. Fog machines are cheap and can usually be rented or purchased for as little as 20 dollars. These machines can cover 1,500 cubic feet with fog per minute, and they are quickly able to completely fill a haunted house with fog. This will decrease visibility, which will enhance the fear of the experience. Also, fog machines do a great job at creating the spooky and other worldly feel that you will want your haunted house to have. Using sound effects is key in truly scaring your guests. Luckily these sound effects can be easily obtained and created. There are various spooky/ scary sound recordings available that you can purchase on line. These CD’s vary in the types of sounds they have on them and in the level of fright that that CD provides. These sounds can be anything from a chainsaw, to chains rattling, to blood curdling screams. However, if you want to truly frighten your guests, it is important to use sounds sparingly. If you constantly use sounds, your guests will become used to the noise. Mix Eerie and utter silence with frightening sounds; this way when a sound is used it will terrify your guests. The best way to pull off a truly terrifying haunted house is to have plenty of people on hand to frighten people. This is where you can get your whole family involved, which is the most fun part of having a haunted house. Have some people dress in terrifying monster costumes, they can then jump out at people in between flashes of the flickering light to really scare them. You can also use people behind the scenes to make sure certain effects run good. You will also need someone out front to let people into the haunted house and someone at the end to give out the candy. In the end it is best to use your imagination; depending on how many people you have there are many great ways in which you can frighten people. However, it is important to remember not to go overboard. If someone seems like they are truly frightened, you may want to back down and lower the fright level of the haunted house. Putting together a haunted house can be one of the best ways to get your entire family and all of your friends involved with Halloween. The great thing about putting together a haunted house is that you can make it truly one of a kind. You can tailor the haunted house depending on if you want to make it fun, scary, or terrifying. No matter what your budget is, you can make an awesome haunted house that will thrill your neighbors. Austin Faux works for 13th Door Haunted Houses in Denver, Colorado. Halloween is my favorite time of the year and you can find me cruising the Haunted House scene! When I’m not writing about Halloween or Haunted Houses you can find me at home helping my beautiful wife relax, playing with my kids and messing around on my nerd podcast, “I Am A Super Nerd.” Find me on Facebook.